Kala(Art) Kuwait has announced the winners of “NIRAM 2018” Children’s Day painting competition held on 9th November 2018 in Association with “AMERICAN TOURISTER”. The prize distribution ceremony will take place at Indian Community School, Khaitan on Friday, 7th December 2018 at 1:30 PM onwards. Kala(Art) Kuwait proudly announce that this is the 14th consecutive year of NIRAM has been conducted on the occasion of Children’s Day, the birth day of Pandit Jawaharlal Nehru, the first Prime Minister of independent India. 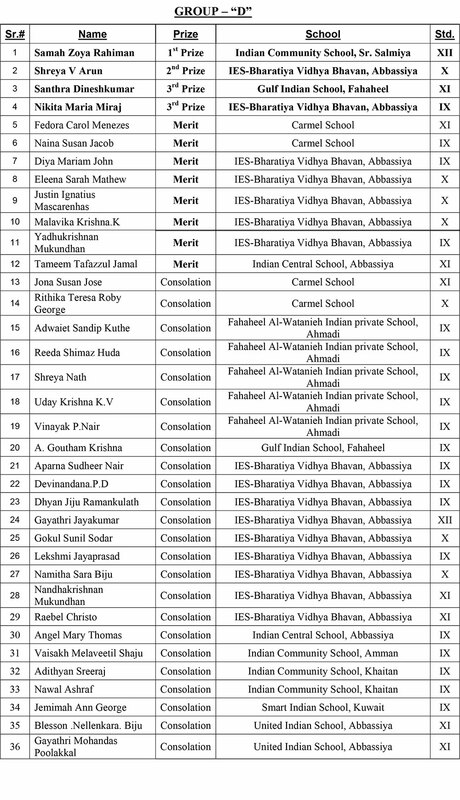 It is worthwhile to note that students of different nationalities from all 24 Indian Schools in Kuwait with the active participation of more than 2400 children in the competition. The School Managements as well as Indian Community including business establishments as sponsors have also voluntarily extended their entire support to this wonderful event. Overall Championship: 1st Position- IES-Bharatiya Vidhya Bhavan, Abbasiya, 2nd Position - Fahaheel Al Watanieh Indian Private School, Ahmadi, 3rd Position- Learners Own Academy, Abbassiya. C. Bhaskaran Memorial Trophy as a tribute to Late. Mr. C Bhaskaran, one of the founder and advisory board member of Kala (Art) Kuwait, won by IES-Bharatiya Vidhya Bhavan, the school from which maximum numbers of students were participated in this event. Group-B: Ist Prize- Joshua Varghese Moncy, 4th Std., IES-Bharatiya Vidhya Bhavan, IInd Prize- Prakruthi Praveen, 3rd Std., Fahaheel Al-Watanieh Indian Private School, & Aida Hisham, 4th Std., United Indian School. IIIrd Prize- Sayyad Ruzeen Fatima, 4th Std., Fahaheel Al-Watanieh Indian Private School & Arnav Nishant Kumbhare, 3rd Std., Fahaheel Al-Watanieh Indian Private School. Group-C: Ist Prize- M.B.Shamroz Khanum, 8th Std., India International School, Mangaf, IInd Prize- Kavya Sandhya Hari, 8th Std., Indian Community School, Amman. IIIrd Prize- Lakshmi Nanda, 7th Std., IES-Bharatiya Vidhya Bhavan & Harigovind Sajith, 7th Std., IES-Bharatiya Vidhya Bhavan. Group-D: Ist Prize- Samah Zoya Rahiman, 12th Std., Indian Community School, Sr. Salmiya, IInd Prize- Shreya V Arun, 10th Std., IES-Bharatiya Vidhya Bhavan IIIrd Prize- Santhra Dineshkumar, 11th Std., Gulf Indian School & Nikita Maria Miraj, 9th Std., IES-Bharatiya Vidhya Bhavan. 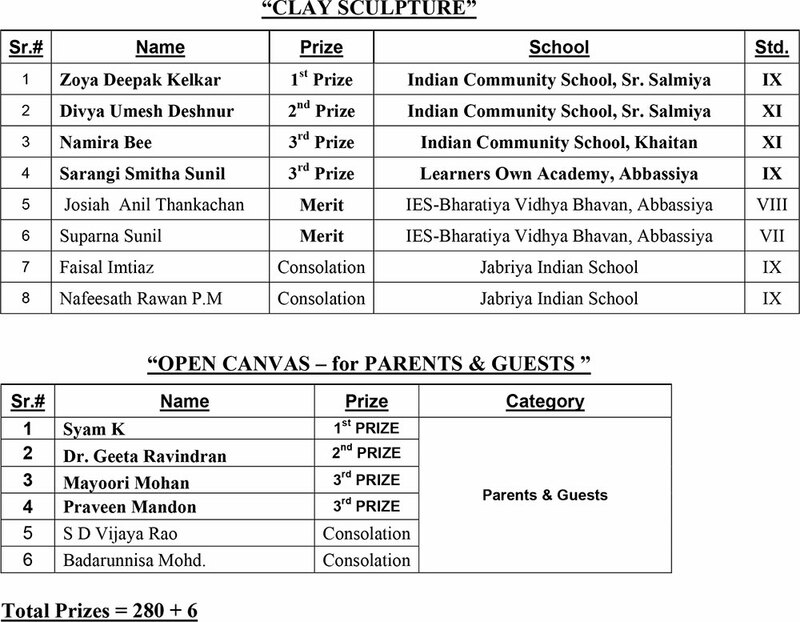 Clay Sculpture: Ist Prize- Zoya Deepak Kelkar, 9th Std., Indian Community School, Sr. Salmiya IInd Prize- Divya Umesh Deshnur, 11th Std., Indian Community School, Sr. Salmiya. IIIrd Prize- Namira Bee Thamsudeen, 11th Std., Indian Community School, Khaitan & Sarangi Smitha Sunil, 9th Std., Learners Own Academy, Abbassiya. Open Canvas (for Parents & Guests): Ist Prize- Mr. Syam K, IInd Prize- Dr. Geeta Ravindran, IIIrd Prize- Mrs. Mayoori Mohan & Mr. Praveen Mandon. Merit Prize: Group-A: Anabia Sarwar, Mariam Afsheen Khan, Meera Vikram Joshi, Neha Reji, Hana Ancy, Katelyn, Krista Binu, Vaika Prajeesh, Angel Maria Jose, Naima Navas, Edwin Stephen Varghese, Norlin C Jobi, Anna Rose, Dave Sajan, Neeharika Ramya Manoj, Spandan Sen, V.Ethan John. 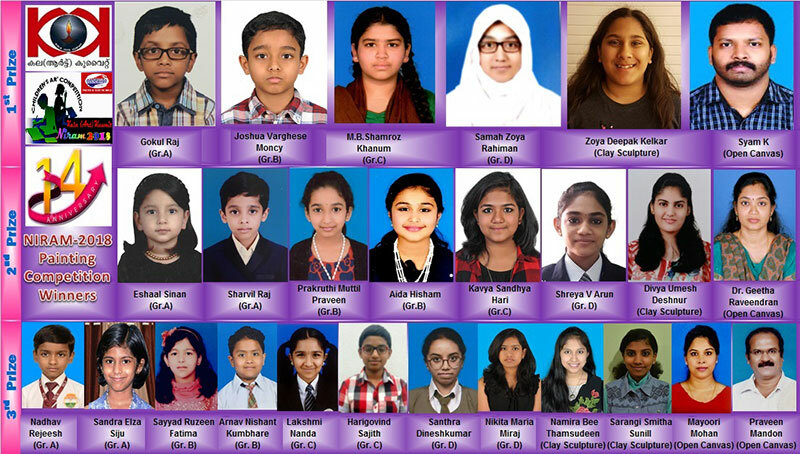 Merit Prize: Group-B: Riya Teresa Rishi, Pooja Giri, Alicia Esther Sony, Anna Mary Viljo, Annabel Maria Sony, Hannah Theresa Seju, Reine Mary John, Snigdha Nambiar, Aleena Mariam Vibin, Amrithaveni Bijumon, Nasli Noushad, Keerthana Jayan Nair, Samantha Smith Sunil, Fatima Siddique, Mohammed Arsh Shaikh. Merit Prize: Group-C: Jovina Ann Mathews, Gauri Sajith, Gauri Krishnan, Jiya George Varghese, Kripa Binu, Krishnendu Vinod, Sanuthi Nihinsa, Manasa Paulson, Neha Navas, Akshaj Anil Kumar, Onega William, Mahira, Ardhra Satheesh, Ebin Babu Olakkankil, Eunice Dinjen, Isaam Thalhath, Neha Mary Bino. Merit Prize: Group-D: Fedora Carol Menezes, Naina Susan Jacob, Diya Mariam John, Eleena Sarah Mathew, Justin Ignatius Mascarenhas, Malavika Krishna.K, Yadhukrishnan Mukundhan, Tameem Tafazzul Jamal. The organizers announced that the entire winners list consisting 1st, 2nd, 3rd, and 59 Merit Prizes as well as 199 Consolation Prizes (Total 280 Prizes) have already been forwarded to all participated Schools. The List may also be available at our website www.kalakuwait.net. Kala(Art) Kuwait, highlights the exclusive prizes for the winners as first place with Gold Coin & gold medal, second place with silver medal and third place with bronze medal along with memento & certificate. Merit and Consolation prize winners also will have memento & certificate. Kala(Art) Kuwait has congratulated all the Winners and also thanked all the participants and the School Managements, Sponsors, all Indian Associations for their wholehearted support to make the event as a great success and well supported by Kuwait's English & Malayalam dailies and Web Portals. The organizers convey their heartfelt thanks to the Parents, Art Teachers and the management of Indian Community School-Khaitan for their unprecedented support for this wonderful event, according to ‘Kala(Art) Kuwait’ President, Samkutty Thomas, General Secretary, Sunil Kumar, NIRAM-2018 General Convener, Mukesh V. P. & Registration Convener Jaison Joseph. Bhavans has been the champions for years and I have seen the proud teachers and kids lift this trophy for years. Well done Bhavans and Prem sir the principal.